Rest in peace Officer Heidelberg! Final Salute Officer Heidelberg. Thank you for your service. You are a hero. Rest peacefully in the presence of God. We are praying for the family and fellow officers. On behalf of the Ohio Bureau of Investigation & our thoughts and prayers are with the immediate family of Police Officer Nathan Hayden Heidelberg and the extended law enforcement family of the Midland Police Department, Texas. On behalf of my family, sending our condolences and prayers to *all* of Officer Heidelberg's family, "both blood and blue". Memories are "God's way saying something had happened, and it mattered a great deal... " Officer Heidelberg mattered. becomes a *memory* the memory becomes a treasure. My family and I would like to extend our sincere condolences to the family, friends, and fellow co-workers of Police Officer Nathan Hayden Heidelberg during this difficult time. May they find comfort and support from those around them. May happy moments from the past bring forth precious memories to cherish for a lifetime. May God help heal their aching hearts. Thank you for your service and may you rest in peace Police Officer Nathan Hayden Heidelberg. God Bless you Officer Hayden Heidelberg ❤️, Rest In Peace. We are so thankful to you for your service, your devotion and your sacrifice. We are so saddened by this terrible news!! Our thoughts and Prayers go out to your family, and all of your sisters and brothers in Blue that protect us. God bless you all!! Deepest Sympathy to the family of Officer Heidelberg and to the Brothers and Sisters of the Midland Police Department,Texas.May God welcome Him and keep Him safe. Rest easy sir. May God comfort your family and friends. Thank you for your service. Salute good sir, this is almost too much to bare. So sad.... May the Peace of Jesus be with you and your family now and forever. Thank you for your service ti a grateful state and grateful nation. 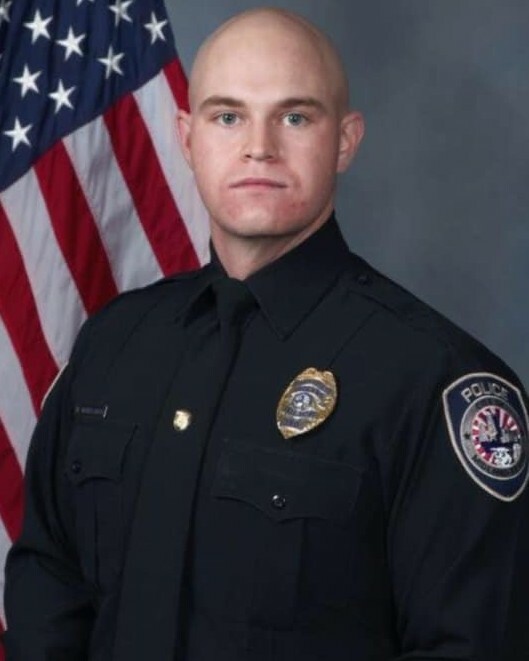 Rest in Peace brave officer..
Lord God, our hearts and prayers go out to the Midland, Texas Police Department and for the family, friends, and colleagues of Police Officer Nathan H. Heidelberg, of the Midland Police Department, who was shot and killed in the Line-of-Duty on Tuesday, March 5, 2019. Depart, dear brother-in-blue, out of this world into the arms of the Father who created you, into the arms of the Son who redeemed you, and into the arms of the Spirit who made you whole. You fought the good fight. Now rest in peace. In Jesus' name. Amen. Your service is appreciated. May God bless your family and the Department with which you served! Thank you. The National Police Wives Association would like to extend their heartfelt prayers to the family of Officer Heidelberg and the Midland Police Department during this time. Thank you, Officer Heidelberg, for your service. Sir, I would just like to say thank you for your service and sacrifice for the citizens of Midland. And to your Family and loved ones, I wish to extend my deepest sympathy. Thank you for your service brother, we’ll take it from here.